Heat oven to 400°F. Mix vegetables, chicken and soup in ungreased 9-inch glass pie plate. Seasoning the base vegetable mixture with your favorite blend of dried herbs—sage, basil, oregano, or dill will bump up the flavor quotient. Leftover chicken from a deli rotisserie bird or from a roast turkey can be mixed in with the frozen vegetables for a heartier pie. Sprinkle the top of the crust with shredded cheese in the last 10 minutes of baking. If you need to get dinner on the table in a hurry, this easy chicken pot pie recipe is the place to begin. While many time-tested, heirloom recipes have come out of the Betty Crocker Test Kitchens over the years, possibly none has proven as popular as The “Impossibly Easy Pie” formulation, which has been a relied-upon recipe since the 1970s. 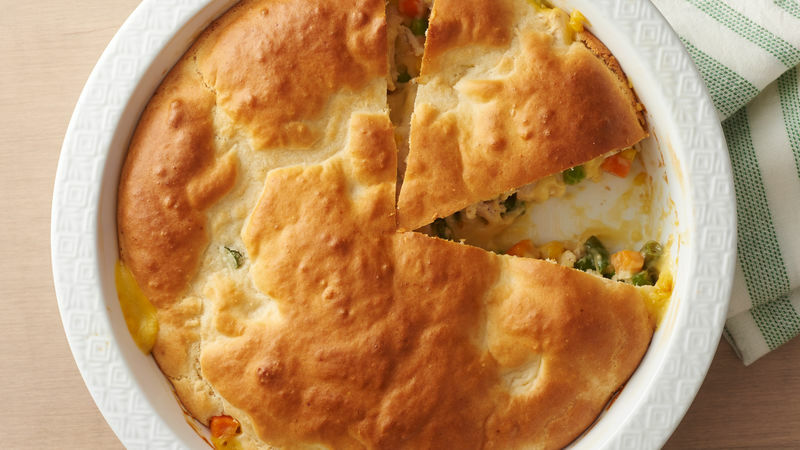 Hundreds of home cooks have embraced on this quick take on chicken pot pie, because it turns out delicious and completely skips the step of rolling out a pie crust! Instead, you just add the filling ingredients to your pie plate and top with the Bisquick mixture, which bakes up into a perfect biscuity crust in the oven. It may seem like kitchen magic, but it’s the dish’s down-to-earth goodness that keeps home cooks coming back to this recipe year after year. For even more ideas, check out Betty’s best chicken pot pie recipes.